CAE Vimedix is the high-fidelity simulator that facilitates engaging and intuitive learning in cardiac, lung, abdominal and Ob/Gyn ultrasound – all on one common platform. With its state-of-the-art manikin-based system and innovative software tools, CAE Vimedix accelerates the development of essential psychomotor and cognitive skills for ultrasound probe handling, image interpretation, diagnoses and clinical decision-making. NEW! CAE Vimedix 2.0 improves performance and supports new augmented reality add-on modules for expanded training in cardiac, abdominal and Ob/Gyn ultrasound. Easier compatibility with Windows 10 plug-and-play peripherals improves performance by streamlining the integration of new software. Sleek and portable computer hardware offers a more modern and appealing interface! Create an immersive training environment for your learners to develop mastery in probe handling and positioning skills with the augmented reality technology of Microsoft HoloLens! Facilitates identification of free fluid using augmented reality 3D depiction of comprehensive anatomy. 3D Holograms of anatomy using VimedixAR with Microsoft HoloLens now available! Learn both the cognitive and psychomotor skills needed for Ob/Gyn ultrasound with a realistic simulated experience. Stand-alone endovaginal ultrasound learning module now available! "Training on Vimedix can reduce the early learning curve for trainees." 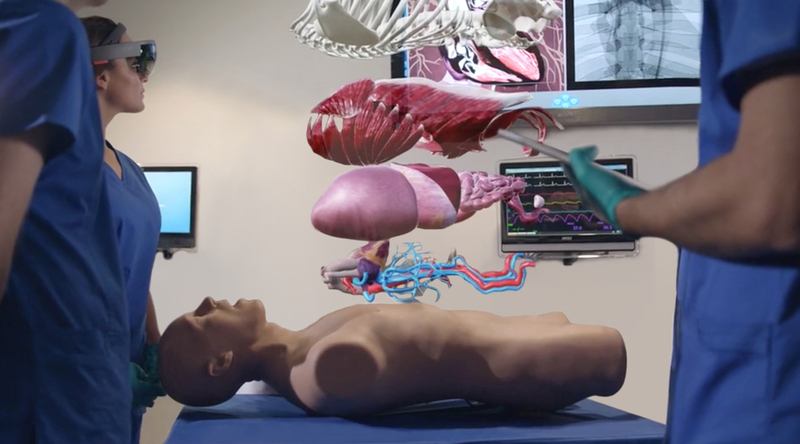 VimedixAR delivers an unprecedented simulation-based training experience, allowing learners to move freely within a clinical training environment that is augmented with holograms. For the first time, students are able to interact with holograms representing human anatomy as they learn how to obtain ultrasound views and assess patients. VimedixAR is now available for the Vimedix Cardiac and Vimedix Abdo base models.